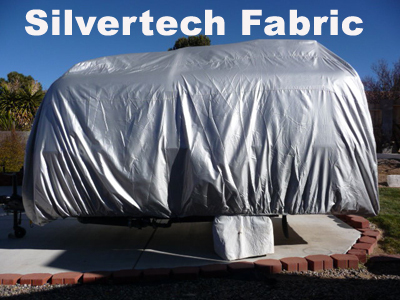 "Cool & Dry" is the key phrase that describes your Travel Trailer when it's shielded by our new 3 layer Trailer Cover. 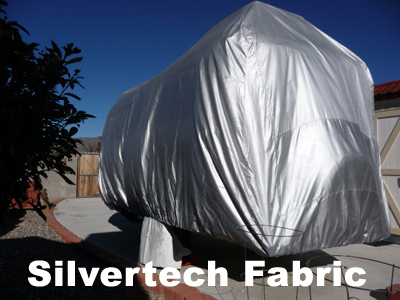 The Casita Travel Trailer Cover fabric is combined with "high tech space age" reflective fabric technology and an innovative design to create the near perfect Travel Trailer Cover. The special fabric is woven from 100% polyester thread. Each thread is specially treated with Pan-Guard water repellent treatment before the fabric is woven. Then it is coated with a special silver polyurethane coating. This process creates a superior, reflective, breathable fabric that is extremely lightweight, strong, durable, water repellent, rot and mildew proof and stays pliable in all weather conditions. The highly reflective surface provides maximum protection from sun and UV exposure while keeping your Casita Trailer cooler inside and out.